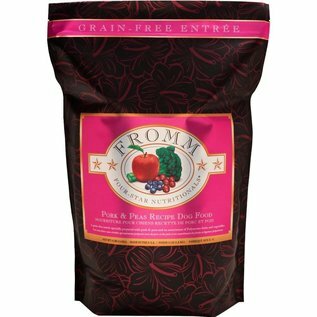 Fromm Grain Free Pork and Peas recipe is a grain free Polynesian style entree of pork and peas combined with an assortment of fresh, handpicked fruits and vegetables. Manufactured in Wisconsin, the Fromm family prepares this artisan recipe in small batches. This ensures consistency, quality, and superior taste in each and every bowl. Fromm Grain Free Pork and Peas Recipe is complete and balanced for dogs of all ages and can be alternated with other Fromm Four Star Recipes.